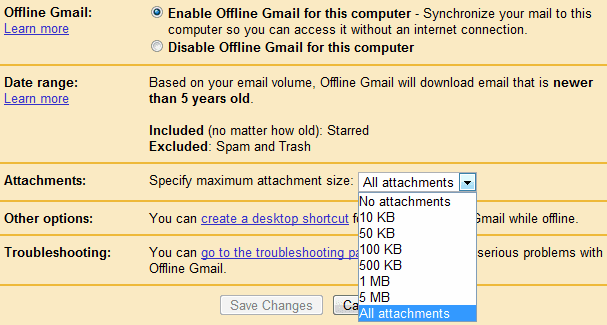 Offline Gmail has been updated to version 0.2 and you can now specify a maximum size for the downloaded attachments. If you don't need to access attachments when you're offline, you can disable the download of attachments. A user of the Gmail Group has a workaround for those who don't have the new version. "It seems to me that for existing users it'll appear only when you disable and then again enable Gmail offline. And you won't have to download your emails again; you can always choose them not to be removed while disabling Gmail offline." Disabled and enabled back again, but nothing changed. Looks like Gmail team has not yet rolled out the feature to everyone. No mention at Gmail official blog. If you haven't downloaded attachments, are they available in flaky mode? If I chose maximum attachment size will ALREADY stored attachments above that size be removed from the computer? Not rolled out in the UK either. This is now rolled out in my US account. Finally! Gmail Is Down. What to Do?